So I just finished Pirate Cinema by Cory Doctorow. A thought provoking quick read. It is set in a not so distant future where things have gone a little bit more out of hand. In particular the media lobby has succeeded in adding some invasive legislation in the copyright land. So in this future your internet can be turned off if you illegally download copyrighted content. The main character - 16 year old Trent - manages to get his families internet turned off and then runs of to London for some serious squatting and the important fight for reasonable legislation. It turns out fine in some ways - in other ways not so good. Highlights are the improvised cinema in a cemetery where films are projected from trees onto the wall of a chapel, another highlight are mosquito zappers - a kind of hat with built in mosquito zapping lasers. The attention to technical detail is really fun. This novel is a good solid voice in frightening times where our creative freedom is at stake. Lets hope our ending is a bit better than the setting of Pirate Cinema. 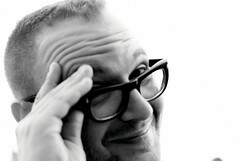 This was my first encounter with Cory Doctorow and I certainly will try to read more of his work. A final word to legislators out there - try to make this world a fun place to live in. Of course - artists should get what they are due - but corporations making a profit out of limiting our creativity should just go away.